CHICAGO, IL (Laserfiche)—September 21, 2012—Laserfiche (booth #427) today announced that Stephanie Storm, Records Analyst for the City of Wylie, TX, will share the secrets of her success with transparent records management on Sunday, September 23, at 2:30 pm in room E351 of Chicago’s McCormick Place. Transparent records management (TRM) is an approach that enables organizations to dynamically configure multiple views of the same repository. 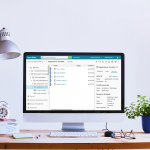 Using Laserfiche enterprise content management (ECM) software, records managers can organize documents in a way that satisfies retention schedules and allows them to quickly find records. At the same time, general users can access documents via shortcuts that are contained in a section of the repository that is organized more logically for their needs. Stephanie Storm has six years of experience in records and information management and implemented a completely electronic records management program for city records. She has taught staff and external organizations strategies to implement current hard copy records into a totally electronic management system, following all standards and requirements for state retention. Since 1987, Laserfiche® has used its Run Smarter® philosophy to create simple and elegant enterprise content management (ECM) solutions. More than 32,000 organizations worldwide—including federal, state and local government agencies and Fortune 1000 companies—use Laserfiche software to manage documents, records and workflow with DoD 5015.2-certified records management functionality that automates record capture, classification and life cycle management—and is transparent to users.